Finally, after over an entire year of construction and building (plus time spent planning, designing and customizing), “move in” day took place in the 40-foot long, 400 square foot gooseneck tiny house on wheels, aka the #TaHOW. It was by the far the easiest and simplest move-in ever. There was more than one suitcase (lol), but there was NO heavy furniture to move or anyone else needed to move in. In fact, it was rather anticlimactic. But that just made it faster to get in and living in the house. Now that’s not to say we moved everything in and had everything set up within minutes or a few hours, but we DID get in, and set up quickly enough to where Lacey came home from work and within a few hours we were soundly asleep in the cozy loft of the tiny house. With all that said, the house still isn’t completely finished and we aren’t completely set up. We thought that would be a nuisance, trying to live in an unfinished space, but its actually been kind of the opposite. Every day the house comes even more alive (its been 72 hours now or 3 days since we officially started living in the house) and continues to transform into an even cozier, comfortable and really good feeling space. It definitely is home sweet home! The transition for the dogs has been a little more challenging. Claude, my 12-year old black lab, doesn’t do so well with steps anymore, so he definitely won’t be able to make it up to the loft but also struggles getting up to the bathroom or front room, so he’s limited to the main floor. Initially he hesitated to even go up the front steps through the french door and did not like the 8 foot long ramp I custom-built just for him (even with slats like a chicken coup ladder or whatever). Sailor, the highland west-terrier, doesn’t mind the steps, and although he normally would sleep in the bed, he’s not a fan of the loft and actually prefers staying down below with Claude (which I’m sure Claude is happy about), and they sleep curled up in their beds, side by side. It’s pretty cute – and not what we were expecting lol. Sailor’s big hangup is the dog door. Claude will go in and out with no problem (just hesitates at the stairs as he’s getting used to them), whereas sailor will just sit outside the back door and stare at us in the kitchen – and even scratch the back door glass on occasion – instead of going thru the dog door a foot to the right of the door. He has no problem using the dog door, he just seems to pretend that its not there and wants his masters to open the “human” door for him (he thinks he’s royalty – King of the tiny house. I’m sure in time he’ll enjoy being perched up on top of the loft, better able to oversee his “kingdom” below… ;). 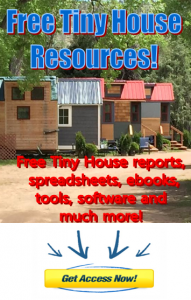 Tiny House Surprises – Extra Space! One of the surprising things so far about living in the TaHOW Tiny House on Wheels has been how much extra space we have in the kitchen! We did end up deciding that the best place for the trash can was under the sink. I do wish I had thought out a better space for that because a larger free standing trash can would work much better. It’s also been good that the house hasn’t been completely finished for that fact that it allows us to continue to customize different spaces for the best utilization of them. For example, I wasn’t sure exactly how we’d use the closet space. It has a 6-foot, 4-inch long closet rod for hanging clothes (which is a premium because that’s hard space to find after the fact if you don’t plan ahead for that). On top of that is two large, tall, deep shelves in addition to a pantry shelving system to the right of and in front of the clothes, closed off to the kitchen. I didn’t know how much food pantry space we needed so I’ve been customizing that as we’ve moved in and brought food into the space to see how it could best be utilized and accessed. I also left space next to the fridge at the back of the house where the dog door is to create a little mud-room type area. So as we use the kitchen and closet and house we’ll determine how to best design that space as well. I was able to build a lot of stuff into the bathroom though I do wish I had built it a little bigger. The washer/dryer took up quite a bit of space that would have been nice for good cabinet and drawer storage of bathroom items, so that definitely is a change we’re adjusting to, but again with some clever storage ideas we’re able to maximize the space. There is a large counter top over the washer/dryer so that allowed for multiple organizing options which gave Lacey the opportunity to incorporate more decor as well. My favorite area of the house so far though is the loft. With the skylight, five surrounding windows, view of the feature cedar wall with the large TV and fireplace and dogs below… its just awesome. And Lacey has decorated it so wonderfully, adding colors, layers, textures (I’m learning a lot of decorating! :), it really has a warm, cozy, homey feel to it, just makes me smile sitting up there or lying in bed looking down below and seeing the rest of the house. It’s cooler than I ever imagined! It’s the space with the view that reminds me just how much time, planning, money and work went into creating and bring to to life this big (but tiny) beautiful baby. To sum it up, we are loving it. Go Tiny Be Free. More posts, pics and videos to come over the next few days, weeks and months as we continue to finish the house (and catch up on sharing all the pics and videos I’ve been taking over the last year!). Still lots to do, watch this space! And if you’re on snapchat, follow me @snaukered and @gotinybefree for live spontaneous, fun pics and videos. And for the latest updates, like the GoTinyBeFree facebook page. Thanks for reading! I appreciate you!